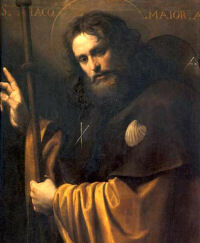 St. James, known as the Greater, in order to distinguish him from the other Apostle St. James, our Lord's cousin, was St. John's brother. With Peter and John he was one of the witnesses of the Transfiguration, as later he was also of the agony in the garden. He was beheaded in Jerusalem in 42 or 43 on the orders of Herod Agrippa. Since the ninth century Spain has claimed the honour of possessing his relics, though it must be said that actual proof is far less in evidence than the devotion of the faithful. The pilgrimage to St. James of Compostella in the Middle Ages attracted immense crowds; after the pilgrimage to Rome or the Holy Land, it was the most famous and the most frequented pilgrimage in Christendom. The pilgrim paths to Compostella form a network over Europe; they are dotted with pilgrims' hospices and chapels, some of which still exist. St. James is mentioned in the Roman Canon of the Mass. According to the 1962 Missal of St. John XXIII the Extraordinary Form of the Roman Rite, today is also the feast of St. Christopher who suffered martyrdom in Asia Minor about the year 250. The devotion of our fathers, taking its due from his name (Christopher means bearer of Christ), caused them to place colossal statues of the saint bearing the infant Christ on his shoulders at the entrance to cathedrals. Thus arose the legend of the giant who carried the child Jesus over a river... and the devotion to St. Christopher as the patron of motorists and all forms of transport. He is one of the Fourteen Holy Helpers. In Spain, he is called El Senor Santiago, the patron saint of horsemen and soldiers, and his great shrine at Santiago de Compostela in that country has been a place of pilgrimage for centuries. He is one of those that Jesus called Boanerges, "son of thunder," the brother of John the Evangelist and the son of Zebedee the fisherman from Galilee. St. James the Greater and his brother John were apparently partners with those other two brothers, Peter and Andrew, and lived in Bethsaida, on the north shore of the Sea of Galilee. How and where James first met Jesus, we do not know; but there is an old legend that makes Salome, his mother, a sister of Mary, and if this were the case, he would have known Jesus from childhood. Along with Peter and his brother John, James was part of the inner circle of Jesus, who witnessed the Transfiguration, were witnesses to certain of His miracles, like the raising of the daughter of Jairus, and accompanied Him to the Garden of Gethsemani. Like his brother, he was active in the work of evangelization after the death of Jesus, and one legend, very unlikely, even has him going to Spain after Jesus' resurrection. His prominence and his presence in Jerusalem must have been well known, for scarcely a dozen years after the Resurrection, he became involved in the political maneuverings of the day and was arrested and executed by King Herod Agrippa. This was followed by the arrest of Peter also, so his death must have been part of a purge of Christian leaders by Agrippa, who saw the new Christian movement as a threat to Judaism. Jesus had foretold this kind of fate when He prophesied that James and his brother John would "drink of the same chalice" of suffering as Himself. The two brothers had asked to be seated at the right of Jesus and at His left in His kingdom, and Jesus told them that they would be with Him in a far different way than they expected. James's death is the only biblical record we have of the death of one of the Apostles, and he was the first of that chosen band to give his life for his Master. Patron: Against arthritis; against rheumatism; Antigua, Guatemala; apothecaries; blacksmiths; Chile; Compostela, Spain; druggists; equestrians; furriers; Galicia, Spain; Guatemala; horsemen; knights; laborers; Medjugorje, Bosnia-Herzegovina; Nicaragua; pharmacists; pilgrims; Pistoia, Italy; rheumatoid sufferers; riders; soldiers; Spain; Spanish conquistadors; tanners; veterinarians. Symbols: Cockle shell; dark-bearded man holding a book; dark-bearded man holding a scroll; dark-bearded man holding a sword; dark-bearded man with a floppy pilgrim's hat, long staff, water bottle, and scallop shell; elderly, bearded man wearing a hat with a scallop shell; key; man with shells around him; mounted on horseback, trampling a Moor; pilgrim with wallet and staff; pilgrim's hat; pilgrim's staff; scallop shell; sword. Learn more about St. James. It is traditional in Spain to make a yearly pilgrimage to St. James of Compostela on July 24. Read more about this custom. From Catholic Culture's Library: Pilgrimage To The Stars and Cycling through time on the Camino de Santiago. Read about Santiago de Compostela, the third largest shrine in all of Christendom. Learn more about the pilgrimage to St. James. Santiago de Compostela, the capital of Galicia and final destination of the famous pilgimage way is certainly among Spain's most beautiful cities. You can take a virtual tour and learn all about this area of the world here. Watch this Spanish news broadcast of the faithful bringing flowers for Our Lady of the Pillar on October 12 during the celebration of the feast at the cathedral, notice the open devotion and enthusiam offered to Our Lady. Tradition says that Mary appeared to St. James before her Assumption. Read more about the apparition here. Plan your own pilgrimage to a nearby shrine. Pope John Paul II said, "To go in a spirit of prayer from one place to another, from one city to another, in the area marked especially by God's intervention, helps us not only to live our life as a journey, but also gives us a vivid sense of a God who has gone before us and leads us on, who himself set out on man's path, a God who does not look down on us from on high, but who became our traveling companion." Read this letter and try to incorporate its spirit into your pilgrimage. St. Christopher, one of the "Fourteen Sainted Helpers," has been highly venerated since ancient times in both the Eastern and Western Churches. The older martyrologies say that he suffered death for Christ; in more recent centuries piety has woven garlands of legend about his name. Christopher has become a giant who wished to enter the service of the most powerful of lords. He first thought that the emperor qualified; later he selected the devil, and finally he discovered Christ to be the most powerful Sovereign over all the world. From then on he served Him with greatest fidelity. Because Christopher was of giant stature, he practiced charity by carrying pilgrims across a certain river. Once a child asked to be taken across. He complied as usual. While carrying the child on his shoulders through the river, it became heavier and heavier, and finally he could hardly support it. Then the revelation was made: "You are carrying the Lord of the world!" It was Christ (Christopher means "Christ-carrier"). The legend has the nature of a symbol. Bishop Vida gives the following exposition: "Because you, O Christopher, always carried Christ in your heart, the artists place Christ on your shoulders. Because you suffered much, they paint you standing deep in the waters. And because you could not accomplish this without being large of stature, they have made you a giant, bigger than great temples; therefore do you live under the open heavens during the greatest cold. And since you conquered all that is difficult, they have given you a blossoming palm as traveling staff." Patron: Archers; automobile drivers; automobilists; bachelors; boatmen; bus drivers;, cab drivers; floods; fruit dealers; fullers; hailstorms; holy death; lorry drivers; mariners; market carriers; motorists; porters; Rab, Croatia; sailors; storms; sudden death; taxi drivers; toothache; transportation; transportation workers; travellers; truck drivers; truckers; watermen. Symbols: Giant; torrent; tree; man with Christ on his shoulders. Have you heard the rumor that St. Christopher is no longer a saint? If so you will find this article by Fr. Saunders interesting. For children from the Baldwin Project the Story of St. Christopher.